1)Boston Globe: "The building looks like an upended carton, the kind you might get in a delivery from a mod store like IKEA." ... "As a presence on a key site in the streetscape of New York, MAD is a huge disappointment." 2)Chicago Tribune: "While no masterpiece, turns out to be a better example of architectural recycling than its critics predicted. What it reveals, other than the questionable judgment of those who insisted upon inflating Stone’s kitsch to masterwork status, is that second-rate buildings can have successful, albeit controversial, second acts." 3)Washington Post: "A building that was hard to love has been turned into a building that is hard to hate." 4)Los Angeles Times: "Cloepfil's attempt to mummify Stone's 1964 building at the same site -- hardly looks poised to succeed as an act of architectural closure. Instead, it may only remind many New Yorkers that idiosyncratic, romantic architecture like Stone's is increasingly rare and valuable these days in Manhattan, an island being slowly overtaken by a phalanx of straight-backed glass towers." ... "On its two most prominent facades, the building now spells out the word 'Hi,' as peppy as Kathie Lee Gifford at 9 in the morning. And the message is not hidden or cryptic. 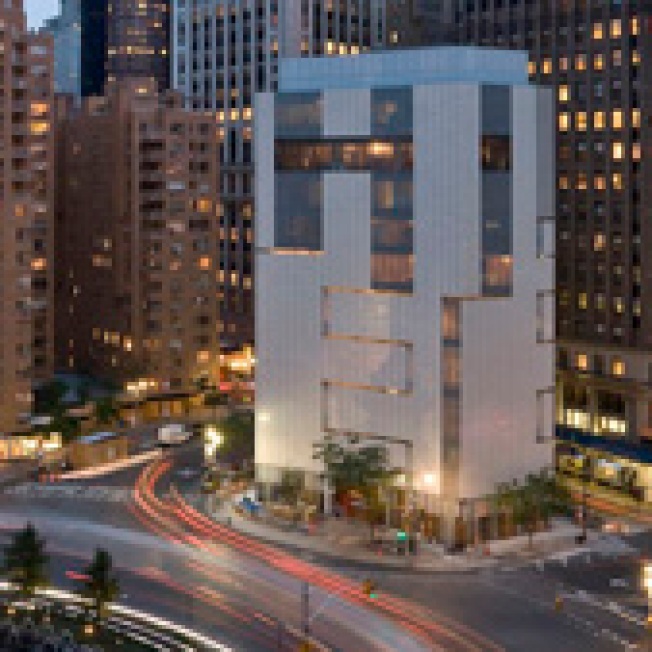 It's delivered in letters five stories high facing Columbus Circle -- a massive architectural text message." Please note that on the East Coast, Kathie Lee Gifford is on at 10 in the morning.